The price hikes at Walt Disney's two American theme parks take the magic away from consumers and their travel budgets. The price hikes at Walt Disney's two theme parks are putting a crimp on consumers and their travel budgets. Disney (DIS - Get Report) could be ruining the Great American vacation and putting a damper on "The Happiest Place on Earth." While Disney has boosted its one-day ticket prices at Disneyland Resort in Anaheim by a whopping 70% over the past decade, according to a report by the Los Angeles Times, attendance has not waned, and the complex's two parks, Disneyland Park and Disney California Adventure, are just as busy even though ticket prices vary daily based on the number of people. For instance, if you attended on August 14, a Monday which might have lower demand, the price is $97, but rises to $110 on regular days, and $124 on peak days. The prices are determined in advance and Disney's website has color-coded the dates. Prices have also risen at Walt Disney World in Orlando but a little more modestly. A ticket for one day is $107 or a 51% increase over the past ten years — it's significantly less than the 67% increase over the same period for a regular ticket to Disneyland. Visitors can also reserve ride times from a mobile app and skip standing in long lines by paying $10 a day for its MaxPass. 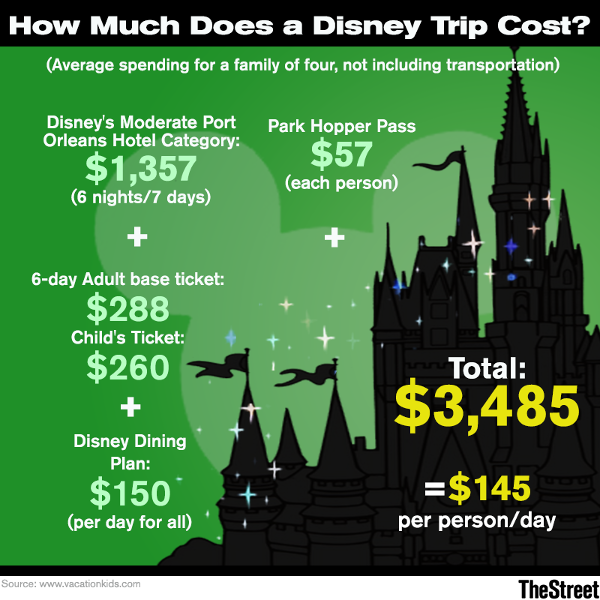 The high costs of attending the Magic Kingdom and the other parks have not deterred Rob Stuart, a 50-year old St. Petersberg, Fla. travel agent and his wife from attending Disney World 30 to 35 times during the past 12 months and Disneyland twice in 2017. For the past seven years, the couple purchased annual passes and went to Disney World an average of two times a month, including special occasions such as their wedding anniversary and birthdays. The annual pass in Orlando is $869 without any resident or military discounts. "There is no other park that has the attention to detail," said Stuart, who hosts a podcast called Disney Travel Secrets, is an authorized Disney vacation planner and hosts a travel TV show. "The parks are constantly changing with new rides. They have incredible dining, hundreds of restaurants, really cool themed bars and an entire entertainment complex." Although they live 75 miles from house, they will spend three to six days each time at the Magic Kingdom, Epcot, Hollywood Studios and Animal Kingdom Theme Park. "We don't have kids and are a very rare, niche customer for them," he said. Is Netflix Just a House of Cards Without All That Disney Content? He advises travelers to plan their trip to either location months in advance and to purchase the multi-day ticket passes and to bring their own food and beverages. The most cost effective pass is the annual pass, even if you only attend the parks once a year because consumers can make monthly payments without accruing interest, Stuart said. "As you add on more days, the per day cost drops," he said. The costs at Disney are definitely pricing out a number of families who simply can't afford to go anymore, said John Kreuzer, vice president of Lumina Communications, a public relations firm based in Campbell, California. Kreuzer spent five days at Disneyland in August with his wife and three children and said the effect of the recent price surges in ticket prices, "as well as already high prices for food, drinks and gifts in their parks, Disney has made it difficult for larger families like my own to visit."